Before discussing more about the scholastic achievement of Allama Hilli we would like to talk about his propagating the word of the Ahl al Bayt (a.s) in Iran which was hitherto a center for the hatred of the Infallibles (a.s). Although the Muhaqqaq Thani, Sheik Qarqi, later on took the responsibility of propagating the Faith, Allama Hilli has to be credited with sowing the first seeds of the Right Path in that vast country. History bears evidence that after Halaku Khan, the Mongol sovereigns embraced Islam and settled down in Iran and ruled there. The question is how the wild Mongol tribes had a sudden change of mind and accepted Islam—the Faith of Peace? It was Khawaja Naseer ud Deen Toosi who motivated them to convert to Islam. The great grandson of Halaku Khan, Sultan Khazan Khan, had inherited the territory of Iran in the year 702 H. It so happened that one day a murder took place in the precincts of a mosque in the capital city. What happened was that after the Friday prayer, an old weak person, a follower of the Ahl al Bayt (a.s), offered Furada (Individually) the Zuhr prayer. When the large gathering noticed him offer the Zuhr prayer they shouted,”This is a Rafizi who prays Zuhr after the Friday Congregation!” The crowd attacked him and martyred him within the very precincts of the mosque.The members of the person’s family went to the presence of Khazan Khan and pleaded for justice. They told him that he was killed in the mosque in the presence of a large gathering. The Sultan was very much affected with the account of the heinous act. He thought what sort of Islam was it that a Sayed, a progeny of the Prophet (s.a), has been murdered in cold blood in the very hall of woship! Then he decided to take the Right Path and embraced the Shia Islam. Although he embraced the Faith, he couldn’t propagate it among the people because of huge numbers of the opponents. After him, his brother Sultan Mohammed became the king. This is the same king who became famous as Khuda Banda. Under him the entire population of Iran adopted Shi-ism. Some people, out of hatred, called him Khar-Banda—Donkey’s Man! He was himself a follower of the Hanafi Sect and his prime minister, Naseerud Deen was a Shafaee. He made all the effors to bring the Sultan into the Shafaee fold. Those days a Shafaee scholar, Nizam al Deen, came from Sheik Toosi’s Madrasa in Bukhara. Sultan Khuda Banda appreciated his erudition and appointed him the Chief-Justice of his relam. Now both the prime minister and the chief judge were Shafaees. The result of this was that the Sultan adopted the Shafaee Sect. At this juncture the scholars from the Hanafi Sect became largely worried. They tried their best to bring back the Sultan to their fold. But the erudition of Qazi Nizam al Deen was of such order that it was impossible for the Hanafis to impress the Sultan in any manner. In 709 H a Hanafi Scholar, Ibne Sadar, arrived from Bukhara. His presence provided some respite to Hanafi scholars in the capital. They now put their heads together to bring back the Sultan to their way of thinking, as, otherwise, he would remain Shafaee for ever and his descendants too would follow the same creed. Qazi ibne Sadr asked them not to worry very much. He talked of his plan to ask Qazi Nizam al Deen a question during the Friday congregation that the Sultan would get disillusioned with the Shafaee Sect and revert back to the Hanafi fold. However, the Friday arrived and Qazi Ibne Sadr went to the mosque armed with his question. He thought that the king would hear his question and instantaneously become a Hanafi. He addressed Qazi Nizam al Deen , “I have a question for you, which, please reply in accord with the Fiqh that you follow.If a person commits adultery with a woman and gets a daughter through this act. Can the man marry the girl” Ibne Sadr knew that the Shafaee Fiqh allowed such a marriage. The question was asked to embarrass Qazi Nizam al Deen and create hate for the Shafaee Faith in the mind of the Sultan. The Qazi only affirmed that his creed allowed such a marriage with a daughter as marriage with mother and sister is permitted in your creed! When the argument proceeded further, books of both the Fiqhs were called for. And it was proved that the statements of both the scholars were veracious. At this point the Sultan stood up with a curse saying what sort of creed is it that allows marriage with a daughter, a mother and a sister! He proceeded to his palace in a huff. Among his ministers was one Shafaee, a Hanafi, a Maliki and a Hanbali. Among the ministers was also a follower of the Right Path. The Shia minister went to the Sultan who incidentally was a childhood friend of his. He asked the Sultan why he looked much worried. The Sultan said he was wondering if he had committed a blunder embracing Islam. During the same period the Sultan was confronted with another problem. He had several wives and he was particularly in love with one of them. He had an argument with this favorite wife and in his anger he pronounced, “Anti taaliqun talaata--- I divorce you thrice!” He uttered this is anger, but when he cooled down after a few days, he started worrying that he would have to give up his favorite wife. He assembled jurists of all the schools and asked them to find a way out of the impasse. All the scholars said in one voice that there was only one solution that the wife married another person, she should have conjugal relations with the man and then he should give divorce to her. Then only the Sultan would be allowed by the Shariah to remarry her.The Sultan couldn’t reconcile himself with the thought of his favorite wife going to bed with another man. The jurists were unanimous in the view that there wasn’t any other way out. At this point one person in the court got up and said that in the Shia Fiqh, the fiqh of the Rafizis, the husband and wife remain undivorced in such circumstance as was faced by the Sultan. The Sultan asked who those people were and where did they live. The man said those people live far away from the capital in a place called Hilla. The clerics in the court started protesting with the Sultan and asked him not to be carried away by what the man had said. They said that the people of Hilla were apostates. The Sultan was so much engrossed with his problem that he waved their objections aside and ordered that the clerics from Hilla be summoned posthaste. If they were found inept and uninformed, their execution will be ordered. The Sultan sent a letter summoning clerics from there. It happened in the year 709 H when Muhaqqaq Hilli was no more there. and added, “ I have only acted on this Quranic Injunction!” The clerics bent down their heads in defeat. They asked, “Why didn’t you sit near us and went so much forward?” Allama Hilli replied, “I didn’t find any other vacant seat!” They asked,” Why did you put the footwear under your armpit? Don’t you know that your act would be tantamount to an insult of the court?” Allama Hilli replied, “I put my footwear under my armpit because once the Prophet (s.a) left his footwear out while visiting someone and a Muslim, perhaps a Hanafi, picked them up and sleeked away!” Hearing this, the Hanafi Clerics protested loudly that he was telling a falsehood because Abu Hanifa was not born at that time. They also said that Abu Hanifa was born a hundred years after the Prophet (s.a). Then how could a man of Hanafi Faith commit such an act. Allama Hilli said, “Perhaps I am forgetful. It could have been a Shafaee person!” Now the Shafaee clerics too protested that Shafaee too wasn’t born at that time. Allama Hilli said, “Then, perhaps it would have been a Maliki who picked up the footwear.” The Maliki Clerics too protested that Malik was born a hundred years after the Prophet (s.a). Allama Hilli said, “It could have been a Hanbali person!” The Hanbali Clerics too objected that Hanbal wasn’t born at that time. Now Allama Hilli struck his point; he turned towards the Sultan and said, “You have heard all of them that they belong to the schools that didn’t exist at the time of the Prophet (s.a). Now hear me about the school of Fiqh that I belong to!” He recounted the names of the 12 Imams (a.s) and said that he was on the Faith of Ali (a.s) and that the Imam (a.s) was there during the days of the Prophet (s.a)!” The Sultan said, “These matters could be discussed later on, but tell me whether the Talaq that I pronounced is valid or not?” Allama Hilli asked, “Were two just witnesses hearing you when you pronounced the Talaq?” The Sultan said, “No! I and my wife in question were the only persons present at that time!” Then Allama Hilli said, “Your Talaq isn’t valid and the woman is your spouse even now. The reason is that a tradition of the Prophet (s.a) has been narrated by Hazrat Ali (a.s) that unless there are two just witnesses to vouch for the utterance of the Talaq.the divorce isn’t enforceable.” The Sultan was pleased but he still had a doubt whether the Faith of Allama Hilli was true or not. If it wasn’t true, the Sultan feared, it would be treading the wrong path. Allama Hilli said, “I am willing to have a debate with anybody to prove the authenticity of my Faith. Therefore Qazi Nizam al Deen was nominated by the clerics of Hanafi, Shafaee, Maliki and Hanbali schools to have a debate with Allama Hilli. Allama Hilli was seated on one side and the four opposing debaters sat one the other side. The debate was long winded and exhaustive, but the summary is that when the discussion was wound up, Qazi Nizam al Deen, who was nonplussed with the arguments of Allama Hilli had only said that how could they turn away from those whom they had followed from the very beginning. He expressed his fear that any such step would cause dissensions in Islamic Society. He therefore said that they would continue to follow the peers of their choice and it wouldn’t be proper to catch or point out their errors of omission and commission. This acknowledgement of Qazi Nizam al Deen was sufficient for the Sultan to conclude that Allama Hilli was on the Right Path. Therefore he adopted the Shii Faith under the guidance of Allama Hilli and made a public announcement of his decision. He also announced that henceforth the names of the Four Imams would be precluded from the Friday Sermons in the mosques and the names of the 12 Imams (a.s) would be included in the Qutbas thereon.He also requested Allama Hilli to address the people from the pulpit the very next Friday. Allama Hilli acceded to this request of the Sultan. At the end of the 6th Century Hijra or the beginning of the 7th Century, the center for the Fiqh of the Ahl al Bayt (a.s) moved to Baghdad. Hilla is a small principality on the banks of the river Euphrates. At that time it was a nondescript, sleepy little town. But because of the presence of erudite Sayed Faqihs a large number of the followers of the Ahl al Bayt (a.s) settled down there moving from bigger towns and cities.Hilla therefore started becoming an important Shia settlement. In those days, because of the internescene fights between the various Muslim sects, invaders started attacking Iraq. Therefore Changez Khan, and his grand-children kept attacking and annexing Muslim territories. Ultimately the day came when Bani Abbas became a story of the past. The invasion of Baghdad is remembered as a black period in the annals of history. When the Tatars started general massacre in the city of Baghdad, the invaluable books from the well stocked libraries were torn and consigned to the waters of the rivers by the wild Mongol tribals. It is mentioned in the books of history that such a huge number of books were consigned to the river that its water turned black. More details about this event will come when we discuss about Khwaja Naseer ud Deen Toosi. When Baghdad was suffering a general massacre, the closeby town of Hilla was assuming more and more importance. When libraries were destroyed in Baghdad, a large number of books on Shia Jurisprudence and history met the same fate. Although the literature pertaining to the traditions of the Ahl al Bayt (a.s) was a victim of the ire of the establishments for many centuries, it again met the same fate as the literature of the other schools during the invasion of Baghdad. When Hilla became the center of Shia learning, one problem was not only of saving the lives and properties of the followers but also to conserve the literature which is the backbone of any school of thought. At such a time Allah gave birth to the Hilli family of Hilla. Because of the efforts of Allama Hilli, Iran became a center for the Shia faith. Allama Hilli was confronted with two problems: one problem was to congregate the Shias at one center that they were scattered in small pockets. Their scattered existence was slowly pushing them away from their Faith.In this direction, before Allama Hilli, Khwaja Naseer ud deen Toosi had done the prelimanry work. The second problem was to collect and consolidate the literature on the Fiqh of the Ahl al Bayt (a.s) that was naturally in the hands of the followers who were scattered all over the territory. They thought of collecting the matter in such an organized way that the traditions of the Ahl al Bayt (a.s) were available in one center. The first center of the Fiqh of Aal e Mohammed (a.s) was Madina Munawwara, it moved to Baghdad, then to Najaf e Ashraf and the fourth center in the making was Hilla. The first Mujtahid there was Najm al Deen Jafar ibne Yahya ibne Hassan ibne Saeed Muhaqqaq the First. We have briefly talked about him in the previous chapter. Before we discuss about Allama Hilli at any length, we would like to mention about the beginnings of the Islamic Fiqh. The books of Fiqh were written earlier but there was no Tarteeb (or systematic arrangement) in them. For the first time, Muhaqqaq Hilli, the maternal uncle of Allama Hilli, wrote his book, Sharaeh al Islam, with such systematic Tarteeb that even today the erudite scholars accept it. He divided the matters of the Fiqh in four parts. The first part was termed as Ibadaat (or Worship), the second part was called the Muamalaat (or the Transactions), the third part as Ita-aat (or Obedience) and the fourth as Ahkaam (or Mandates). These four aspects of the Fiqh that Muhaqqaq Hilli arranged are being followed by our people even to this day. For any matter of Fiqh, Niyat (or Intent) is very important. Therefore the first chapter of the Fiqh has to be Ibadaat (Worship or Prayers) where making Niyat (or Intent) is necessary. The aspects of the Ibadaat are Namaz (Prayer), Roza (fasting), Khums and Haj where it is mandatory to make the Niyat before performing them.They cannot be done without expressing the Niyat. One may offer thousands of prayers (Namaz), but without Niyat they wouldn’t be valid. The mandates of Shariah are of two types—Niyat is compulsory for the one and isn’t required for the other. The second chapter is Muamalaat (or the Transactions) where making a Niyat isn’t mandated but making of oral agreements between two parties is sufficient. The third chapter is Ita-aat (or Obedience) where it isn’t necessary to make a Niyat. The fourth chapter is about Ahkaamaat (or Mandates) where neither a Niyat is necessary nor uttering acceptance orally is required. The later jurists followed the same arrangement while writing books on Fiqh. It will be interesting for the reader to briefly recount about the life of Allama Hilli. Allama Hilli, whose Kunyat was Abu Mafsoor and his first title was Allama, the second Jamal al Deen and the third Jamal al Millat wal Haq wal Deen. His given name was Hassan and his father was Yusuf. Chronologically his complete name is Hassan ibne Yusuf ibne Ali ibne Mazaher. Since he haled from Hilla, he is popularly known as Allama H Hilli. Allama Hilli was born and died in the town of Hilla. After his death his mortal remains were taken to Najaf e Ashraf where he has been interred under the minaret of the mausoleum of Hazrat Ameert al Momineen (a.s). Even today people visit his graveside to pay their respects. One very significant thing about Allama Hilli is that he is a rare personality who became a Mujtahid at a very tender age before attaining majority. 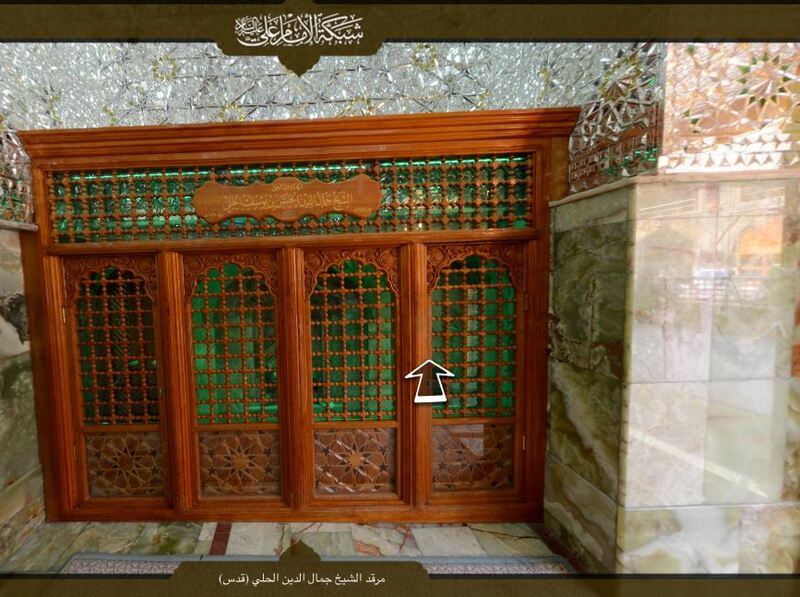 It was a very blessed family that they had 10 Mujtahids at the same time. While Allama Hilli was a Mujtahid, his father Allama Yusuf ibne Ali Ibne Mazaher too was a Mujtahid, his maternal uncle and mentor Muhaqqaqq Hilli was a Mujtahid, his brother was a Mujtahid, his son Fakhr al Muhaqqaqeen was a Mujtahid, his grandson was a Mujtahid and four of his nephews too were Mujtahids. 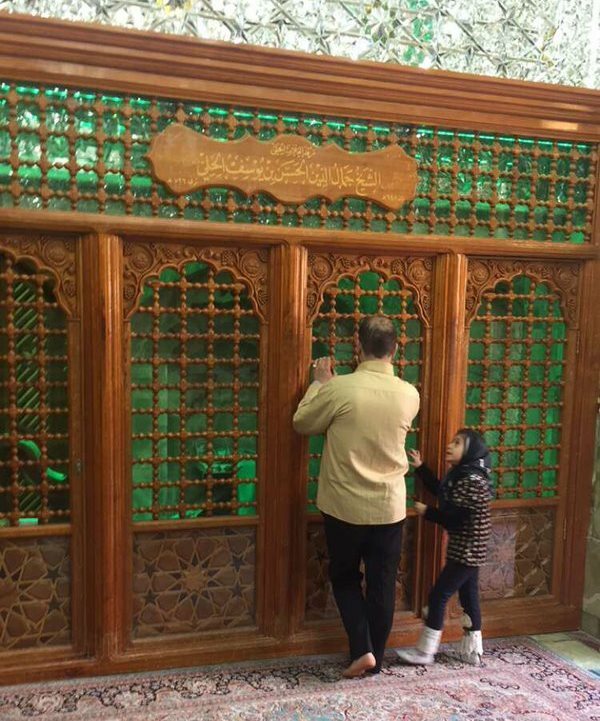 This family has rendered invaluable service to the Shia Faith. When the mason said that he wished he were the mud, the little child recited this verse from the 3oth Chapter of the Holy Quran. This proves the learning and skill of Allama Hilli at that tender age of 4-5 years! Allama Hilli is one of the two or three scholars whom the Imam e Zamana (a.s) met on several occasions. There have been many instances, but we shall mention only some. It was the time of Allama Hilli’s youth. He was still a student of his mentor. During the times of Allama Hilli students of any school of Fiqh had no reservation in approaching mntors of other schools to take lessons from them. Shia students used to approach the Sunni teachers and the Sunni students had no inhibition in approaching the Shia mentors. Among the teachers of Allama Hilli, while there have been very eminent Shia teachers, he drew benefit from learned men of other schools as well. He took lessons from them and obtained Ijaza (certificates of Proficiency) from them. He is still in his youth and not yet endowed with the title of Allama Hilli. He is already a Mujtahid within his own rights but people have not yet started recognizing him as a Allama. One of his mentors was a Sunni scholar.He had written a voluminous book in refutation of the Shii Faith. He used to go to several mosques and recite extracts from the book to his audiences there. He knew that if the book fell in the hands of the Shias, they would write a befitting reply. He therefore closely guarded the book and limited to private circulation. Those were the days when there weren’t any printing presses and all the books were in the form of manuscripts. Allama Hilli was curious to get hold of the book and read it. Allama Hilli had specialized in the field of Ilm al Kalam that consisted in replying to the objections raised by other schools vis- a-vis the Shii Faith. He was told that the book written by his Sunni teacher was creating doubts in the minds of some gullible persons and he wanted to counter this. He requested the teacher to lend him the book several times, but the person wasn’t yielding. One day he literally pleaded with him. The teacher had some regard for his brilliant student and had ultimately yielded to his entreaties. He gave the book to Allama Hilli with the condition that he should return it the very next morning. Allama Hilli got the book after the Isha prayer and he was to give it back at the time of Fajr prayer in the morning.It was practically impossible to copy the entire book in those few hours before the Fajr. He however started copying the book. After mid-night he fell asleep. He saw the Imam e Zamana (a.s) in his dream. The Imam (a.s) said, “You take rest, I shall copy the book for you.” When Allama Hilli awoke in the morning, he found the entire book copied and ready as if someone has miraculously done it in the night. Qazi Noor Allah Shustari, Shaeed e Taalit, records the same incident in his book, Majalis al Momineen, in a different way. He writes that when Allama Hilli started copying the book in the night, an Arab opened the door of his room and entered. And said,“O Sheik! I shall write the text and you keep arranging the pages in order!” Allama Hilli agreed to the suggestion. The time Allama Hilli took in placing one page below the other, the Arab gave him the next page. The book was finished well ahead of the dawn. The third version of the incident is mentioned in the book “Qasaes al Ulema”. The author writes that Allama Hilli wasn’t a student of the Sunni scholar, but he was keen to peruse his book. Allama Hilli sent a disciple of his to the scholar to borrow the book from him. He asked his disciple to become the person’s student, gain his confidence and somehow borrow the book from him. Aftersome time the student was able to borrow the book. While Allama Hilli was copying the book, he fell asleep. When he awoke in the morning he worried that he had got the book with the condition that it would be returned in the morning and the copying was very incomplete. When he went forward to pick up the book, he found another similar book placed near it. At the end of the copy it was transcribed, “Copied by Mohammed ibn al Hassan Askari”. To help in the effort of Allama Hilli, the Imam e zamana (a.s) himself came to him.
. History bears evidence that it was not the first, and only occasion, when the Imam e Zamana (a.s) met Allama Hilli. Allama Hilli said that once he was proceeding from Hilla to Karbala. On the way an Arab traveler joined him and both proceeded together. During the conversation on the way Allama Hilli felt that the person was highly learned. He was surprised that the person was highly erudite in learning and he hadn’t come across him so far. Allama Hilli says that the incident happened when he already had recognition as Allama. He felt that he had certain questions in his mind which had remained unanswered for long. He thought of posing the questions to the person who certainly was very learned. When all the questions were made, one after the other, he replied all the questions very easily. He was wondering that the questions which lingered in his mind for years and none was able to reply them were handled so easily and dexterously by the stranger. The last question that he had put to him, and he had answered, Hilli asked him if he had any tradition of the Imams (a.s) to support his contention. He smiled and said, “You have a little misunderstanding! Take Sheik Toosi’s book, Tahzeeb, and look up such and such a page and the tradition is recorded on such and such a line of that page!”Allama Hilli says that when he saw such erudition in the person, he told him that he wanted to ask only one more question. He said that for a very long time the question had been in his mind and he wanted that learned person to answer it. The question was that, in the period of Ghaibat (Absence) of the Imam (a.s), can anyone have the privilege of meeting him. When Allama Hilli asked this question, the whip that he was having in his hand fell down. The Arab reined his horse, got down, picked up the whip and gave it back to Allama Hilli. In that time he told to Allama Hilli, “You are asking me if anyone can meet the Imam e Zamana? What better answer could be that the Imam (a.s)’s hand is in your hand. Allama Hilli says that when he heard this much, his body shivered and he dismounted from his mule to bow down to pay his respects to the Imam (a.s). But he fell down unconscious in the process. When he recovered his senses, the Imam (a.s) was gone! When he returned home, the first thing he did was to go to his book shelf, take out Sheik Toosi’s book, open the particular page and read the line indicated by the Imam (a.s). He got the tradition that he wanted to see. Allama Hilli made a small foot-note on the page that the Imam e Zamana (a.s) had informed him about that Hadith. This book, with Allama Hilli’s noting was available in the library till some years ago. A very famous incident about Allama Hilli is recorded in the history. Allama Hilli authored a book, Tazkirat al Fuqha. In that book he wrote that if one supplicates on 40 nights of Jumah in Karbala near the grave of Imam Hussain (a.s), he will have the opportunity of meeting his Imam (a.s). When the students got their vacation, Allama Hilli rode on his mule from Hilla to Karbala and spent 39 nights of Fridays supplicating near the grave of Imam Hussain (a.s). On the 40th night while proceeding towards the Mausoleum he thought that when he completed his supplications that night, he should be able to meet the Imam (a.s). This is the journey of a great scholar from Hilla to Karbala. During his journey a scholarly question came in his mind. There are many traditions saying that if someone cries with the thought of the hardships faced by Imam Hussain (a.s) and a tear comes out of his eyes, all his sins would be condoned by Allah.He wasn’t able to understand this tradition how only crying could get condonation of sins for a person. He was riding with this thought in his mind when he came across an Arab riding on a horse. He came near Allama Hilli and started riding side by side of his mule On the way the person asked him where he was going. Allama Hilli explained to him that he had read the tradition that if a person supplicated at the graveside of Imam Hussain (a.s) for 40 nights, he would then meet the Imam (a.s). He also told to the Arab about the question in his mind about a person getting absolution of his sins if he shed a tear for Imam Hussain (a.s). The Arab asked him if he wanted answers for both his questions. He asked Hilli that if a king is out hunting, lost his way and reached a place where there is a vacant hut where an old woman lived on the milk of only one sheep. The king reached the hut absolutely thirsty. The woman proferred the milk to him immediately. When the thirst was quenched, the king complained of hunger. The woman immediately slaughtered her only sheep, made kebabs and offered to the king. While leaving her, the king told her who he was and asked her to meet him whenever she visited the capital. The person asked Allama Hilli how much the king must serve the old woman to compensate for the service she provided to him in his time of dire need! Allama Hilli told to the Arab that if the king gave to the old woman his entire realm, it wouldn’t be sufficient. The Arab asked again, “Why not ten sheep, fifty sheep or a hundred sheep in return for that one sheep of the old woman?” Allama Hilli said that the woman had parted with her entire possession that was a life-line for her in that wilderness and she had sacrificed it for the king, on humanitarian concern, without even knowing him or his status! It would mean nothing extraordinary even if the king gave her the entire kingdom in return for her sacrifice for him.The Arab said, the answer to your question lies in this. Imam Hussain (a.s) made his supreme sacrifice in the way of Allah. If Allah gives to him His entire universe, it wouldn’t surprise anyone! The Arab told Allama Hilli that the answer to his second question was that the Imam e Zamana (a.s) was there in front of him! Allama Hilli got the blessing of meeting the Imam (a.s) as return for his supplications on 40 nights. Now, when he turned to look, the Imam (a.s) had already left. Allama Hilli said that in these verses there is Durood for persons other than the Prophet (s.a) as well.The Holy Quran says that there is a group of people of the Faith who, when a calamity befalleth them, say that they belong to Allah to whom they shall return.On those people Allah sends His Durood ( Benediction or Salutation). At this point Ruk al Din stood up and protested that the verse is for the people who had faced calamities. He asked what calamities were faced by the the Al e Mohammed (s.a)? Allama Hilli briefly recounted the hardships that the Ahl al Bayt (a.s) faced and then said such a sentence that the entire gathering looked at Rukn al Deen Amili and smiled in derision.After recounting the troubles faced by the Ahl al Bayt (a.s), Allama Hilli told Rukn al Deen, “You have heard what I have said. Tell me what greater calamity could befall the progeny of Mohammed (s.a) .You call yourself a Sayed and praise the enemies of the Al e Mohammed (s.a). You call yourself Al e Rasool (s.a) and keep treading the path of their enemies!.What greater calamity could befall the Al e Mohammed (s.a)!” When the crowd heard this, the entire gathering started ridiculing Rukn al Deen Amili. Some said that he was worse than a dog, because if a puppy is born to a dog, it would follow in the foot-steps of the parent. He was a Sayed-Zada and was following the enemies of the Ahl al Bayt (a.s). If Allama Hilli hadn’t replied to the snide question of Rukn al Deen properly, Amili would have played with the sentiments of the crowd and all his efforts during the debate at the court would have gone in vain. A similar situation arose years ago in the court of Nizam al Mulk when the king adopted the Right Path the mobs were made to turn against him and assassinated him.But here, Allama Hilli was successful in the debate at the court and also won the hearts of the crowds at the mosque. People started coming in hordes and accepting the Right Path. While Allama Hilli was on his way to Iran, along with his son Faqr al Mohaqqaqeen he also had Mulla Hassan Kashi along. Mulla Kashi was not an erudite scholars but he had his own sense of humor and was capable of making effective presentations. In the court of Sultan Khuda Banda he was able to convincing demonstrate the way the Shias offer their prayer in comparison with the people of other schools. He proved his point referring to the books written by the Faqihs of the other schools. Sultan Khuda Banda desired Allama Hilli to stay permanently in Iran. But he excused himself and returned to Hilla. At the death of Muhaqqaq Hilli in 676H, Allama Hilli was a young person of 28 years when he became the Marja (Pontiff) of the Shias and held this function for 50 years till his demise.In that period he had written innumerable books. An estimate has been made that he had penned, on an average a thousand pages per day! This estimate is made from his day of birth till he breathed his last! It is a wonder that one cannot read a thousand pages in a day, writing so many pages is another thing! In fact, to get an average of writing 1,000 pages since birth, Allama Hilli might have written 2,000 pages a day from the time he completed his education and started writing. Allama Hilli’s piety had been proverbial. It is said that he had completed, three or four times over, the mandatory prayers for his lifetime. He did this to ensure that inadvertently he might have made some error during his prayers and it might have gone void. Allama Hilli was a twice blessed person that when he left this world, he left behind a son about whom people say that there was no difference in the erudition of the father and the son. His son was Mohammed and whose title was Fakhr al Mohaqqaqeen. Allama Hilli’s last will and testament to his son was that he wanted him to complete writing the books that he left unfinished. He also asked the son to peruse his books and make corrections wherever necessary. This statement of Allama Hilli proves the capability and erudition of his son. Fakr al Mohaqqaqeen, although he lived to an age of 80 years, wrote very few books because most of the time he was busy revising his father’s works in respect of his last will. The most popular book of Allama Hilli that his son completed is “Kitab Alfain”. This is the book in which Allama Hilli has given 2,000 reasons justifying the Khilafat of Hazrat Amir al Momineen (a.s). Half the book was written by Allama Hilli and the other half was completed by his son.